Every play needs a set, whether the audience realizes it or not. From a bare wood floor to a drab apartment that slides open to reveal a musical fantasy land, the set is the canvas upon which the actors come to life. But, rather than creating a set from scratch, what happens when a director asks you to simply adapt a design that’s 30 years old? The short answer, as student designer Conor Farrell discovered, is that there’s nothing simple about it. Running March 14-23, Phoenix Theatre is presenting 7 Stories by Canadian playwright Morris Panych as the final production of their mainstage season. 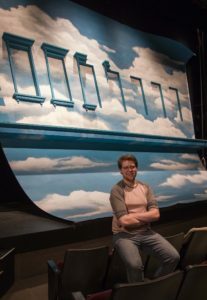 Given that the play is currently celebrating its 30th anniversary, director and theatre professor Fran Gebhard wanted to see the original set design brought back to life for her production in Phoenix’s Bishop Theatre. 7 Stories takes place entirely on a seventh-storey window ledge, where a man is in the midst of a life crisis. 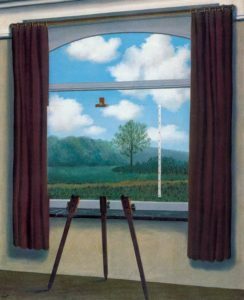 While reflecting on his life, he is interrupted by the quirky residents and their self-absorbed problems; through their interactions, however, the man finds the courage to take the next step. Panych’s quick-witted, fast-paced comedy philosophizes about life and death, right up to its existential conclusion. 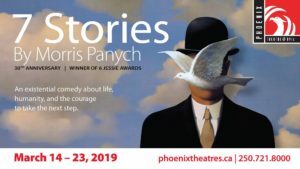 You can read more about the Phoenix production of 7 Stories in some of the advance media coverage it received, including this Times Colonist story, this CTV Vancouver Island segment and this piece from Monday Magazine. For Farrell, that meant adapting the 2009 version of MacDonald’s set—which was originally designed for the 1989 production at Vancouver’s Arts Club Theatre, before needing a few modifications for a 20th anniversary mounting at Theatre Calgary—into one cohesive construction that works with the Bishop’s entirely different stage shape. Given that 7 Stories happens entirely on the ledge of an apartment building, Farrell’s set is a massive 23-foot-tall facade, shooting up from below the stage’s edge and melding into a sky of clouds. As we talk in the audience of the 208-seat Bishop Theatre, we get quick glimpses of the set crew through the faux-windows; swinging hammers and laughing as they work, the students create mini-stories of their own as they assemble the massive design. In addition to his actual design work—using Vectorworks, a drafting program, and building a traditional maquette or set model (“the maquette helps people visualize how big the set is, whereas Vectorworks is about sizes and sightlines”)—Farrell also did a fair bit of research into 7 Stories itself: writing a research paper about three-decade’s worth of productions of this now Canadian classic, meeting with director Gebhard and design professor Patrick Du Wors, working with the all-student creative team, overseeing the actual set construction, and having a Skype call with MacDonald himself. “He wasn’t 100 percent sold on it at first, so we had a small back-and-forth and adapted our design,” he chuckles. The public is also invited to a free preshow lecture with award-winning playwright and Fine Arts alumnus Mark Leiren-Young at 7 p.m. Friday, March 15. Currently an instructor with the Writing department, Leiren-Young will discuss the significance, history and secret origins of Morris Panych’s modern masterpiece. 7 Stories previews at 8pm Tuesday and Wednesday, March 12-13 (just $8). It opens at 8pm Thursday, March 14, and runs to March 23, with 2pm matinees on March 16 (with sign language interpretation) and March 23. Tickets range from $16-$26 at the Phoenix Box Office, which is open noon to 8:30pm, Monday to Saturday and at (250) 721-8000. It’s neither a surprise nor an exaggeration when UVic describes Ideafest as being about “ideas that can change everything.” This eighth-annual, week-long festival of research, art and innovation runs March 4-9, both on- and off-campus, and offers more than 40 public events designed to inform and engage with thought-provoking and culturally engaging events. And Fine Arts is participating in eight different events this year. As always, Fine Arts is once again an active Ideafest participant, hosting four separate events of our own and participating in four others across campus. All are free, unless otherwise noted: you can view the full Ideafest schedule here, which is searchable by day or category, but here’s our list of events. The Visual Arts department’s Drawing 300 class continues its tradition of staging an outdoor drawing exhibition near the Fine Arts building for the duration of Ideafest. Led by Drawing 300 instructor David Gifford, students this year are interpreting meta-drawing and encounters with “aboutness, the recursive and the beyond.” Drawing 300 makes an outdoor exhibit of pictures about pictures. Prepare to have your assumptions challenged! 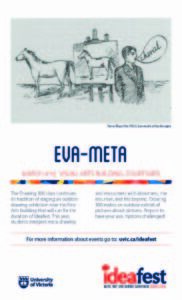 The Eva-meta exhibit runs Monday-Friday, March 4-9, outdoors in the Visual Arts building courtyard. Get a taste of the amazing research and creative activity taking place at UVic, as told by our talented students, faculty and staff. 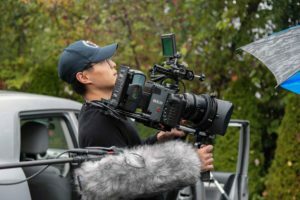 A juried collection of short videos highlighting UVic research and how it’s having an impact on our lives and our world will be showcased for one night only. Prepare to be amazed and inspired! Hosted by Lara Lauzon (School of Exercise Science, Physical and Health Education) and juried by Jay Cullen (School of Earth and Ocean Sciences), Cody Graham (Filmmaker and multimedia producer) and Katrina Pyne (Hakai Magazine). 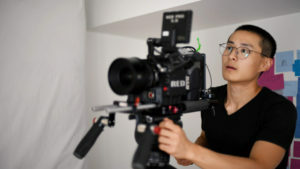 Among the entries this year are short films created by current students Peter Ojum, Leah Tidey and Chen Wang, plus recent alumnus and current Artist in Residence at Oceans Network Canada, Colton Hash (also last year’s Research Reels winner). 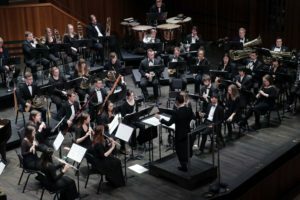 Their films cover topics ranging from applied theatre practice and choral research to the research and creative practice of Visual Arts professor Kelly Richardson, and her current IMAX video installation commission from the XL Outer Worlds project, celebrating the 50th anniversary of the IMAX camera — a Canadian invention! Be sure to attend and vote for our faculty’s films in the viewer’s choice category! Research Reels: Video showcase runs 5-6:30pm Tuesday, March 5, at Cinecenta in UVic’s SUB. And there will be free popcorn! Meet the next generation of Canadian Literature as MFA students from UVic’s legendary Department of Writing read (and perform) from ground-breaking graduating manuscripts in fiction, poetry, playwriting and creative nonfiction at this lively (and licensed) literary cabaret. Hosted by Writing professor Maureen Bradley, graduate student readers include Vaughn Gaston (fiction), Taylor Houghton (fiction), Janet Munsil (playwriting), Tom Prime (poetry) and Miles Steyn (creative nonfiction). Watch for guest appearances by faculty mentors. 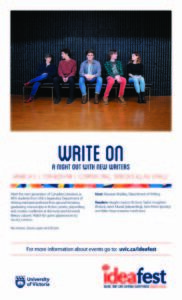 Write on: A night out with new writers runs 7-8pm Tuesday, March 5 at the Copper Owl Bar & Lounge, 1900 Douglas Street (above Paul’s Motor Inn). Meet the next generation of leading Canadian researchers at UVic’s Jamie Cassels Undergraduate Research Awards (JCURA). Awards go to exceptional undergrad students to carry out research in their field of study. The JCURA research fair will feature over 100 of these inspiring projects, ranging from the effects of meditation on memory retention, to improving emergency water treatment in refugee camps. Fine Arts participants include Hannah Bell (Theatre), Kai Conradi (Writing), Jamie Crystal (Music), Kim Dias (Writing), Pascale Higham-Leisen (AHVS), Sarah Kapp (AHVS), Trevor Naumann (Music) and Lee Whitehorne (Music). Just click on their individual names to read a brief of their research projects. The JCURA symposium runs 11:30am – 3pm Wednesday, March 6, in the Michele Pujol Room (A121) of UVic’s SUB. Each year, UVic faculty, staff, students and alumni publish an incredible amount of intellectual content, reflecting a wide range of research, teaching, personal and professional interests. Join UVic Libraries for this annual celebration of books written by UVic — including Writing professor Bill Gaston, who will be reading from his recent memoir, Just Let Me Look at You: On Fatherhood, and recently retired Writing instructor Patrick Friesen, reading from his latest poetry collection, Songen. Hosted by Jim Forbes, Director of Campus Services, other readers include History professors Jason M. Colby, reading from his Orca: How We Came to Know and Love the Ocean’s Greatest Predator, and Lynne Marks, reading from her Infidels and the Damn Churches: Irreligion and Religion in Settler British Columbia. The UVic author celebration runs 2-4pm Thursday, March 7 at the UVic Bookstore. 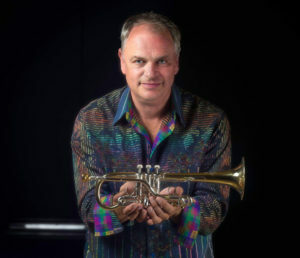 Experience the beauty of an orchestra from the inside out at this unique rehearsal of the UVic Orchestra, where seats for visitors will be interspersed among musicians to provide an unforgettable opportunity. Immerse yourself as never before in the works of Tchaikovsky and Debussy. Feel the magic of being in the midst of it all. 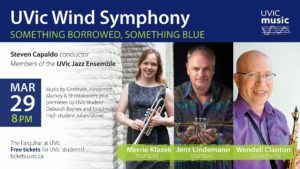 Hosted by School of Music conductor and professor Ajtony Csaba and featuring the student musicians of the UVic Orchestra. 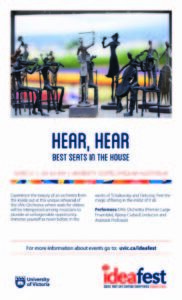 Hear, hear runs 3:15-4:15pm Thursday, March 7 at The Farquhar in UVic’s University Centre building. Can the impact of dementia be reduced through singing and socializing? An interdisciplinary research team at UVic — including School of Music professor emeritus Mary Kennedy— is studying the impact an intergenerational choir may have on health outcomes for people living with dementia and their caregivers, as well as the impact on perceptions of dementia for participating high school students. Hear about the researchers’ findings and observations, then listen to this joy-filled choir share their music. Hosted by UVic School of Nursing professor Deb Sheets, presenters include not only Mary Kennedy but also Erica Phare-Bergh (Choir Director), Stuart MacDonald (Department of Psychology) and Andre Smith (Department of Sociology). With thanks to project partners Island Health, St. Andrew’s Regional High School, St Aidan’s United Church, the University of Victoria’s School of Nursing, School of Psychology and School of Sociology. Voices in Motion runs 4-6pm Thursday, March 7 at St. Aidan’s Church Sanctuary, 3703 St. Aidan’s St. Note: registration is required for this free event: register here. An expansion of the current Legacy Gallery exhibit,Translations: The Art and Life Of Elizabeth Yeend Duer-Gyokushō玉蕉, Ideafest welcomes Vancouver-based contemporary artist Cindy Mochizuki for a collective embroidery and listening experience focusing on the racialized effects on women of Japanese descent in British Columbia. Visitors will work together with Mochizuki to embroider an image informed by historical references to Japanese Canadian women during and after World War II, while listening to audio recordings of interviews of Japanese Canadian women exploring issues of race, class, citizenship, nationhood and diaspora. Other Faces of Nijhonga runs 4-8pm Friday, March 8, and 11am-3pm Saturday, March 9, at the Legacy Art Gallery, 630 Yates St.
Translations continues to April 6, also at the Legacy Gallery, and showcases the movement of ideas, aesthetics, politics and people between England, Japan and Victoria by looking at the life and work of Anglo-Japanese artist Elizabeth Yeend Duer (1889–1951). Born a British citizen in Nagasaki to an Englishman and a Japanese woman, Duer studied Nihonga, a traditional Japanese-style painting, with the renowned painter and teacher Atomi Gyokushi. 跡見 玉枝. Duer took on the artistic identity of Gyokushō 玉蕉. She immigrated to Victoria in 1940 and is among the remarkably few people of Japanese heritage who were not interned during World War II. 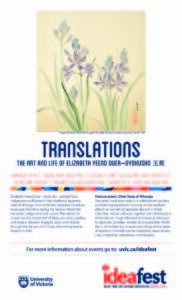 Instead, she Japanized her new environment by producing Nihonga-style paintings of local indigenous wildflowers while her own identity was being anglicized. This exhibit is co-curated by Art History & Visual Studies professor Carolyn Butler Palmer, Mikiko Hirayama (University of Cincinnati) and Janice Okada (BA, MM St). This is a project of the Williams Legacy Chair in Modern and Contemporary Art of the Pacific Northwest. Other Ideafest events that will have appeal for Fine Arts followers include the Re-imagining Justice: Art, Law & Social Change exhibit (March 4-8), Latin American Muralism and Identity (March 5), the Express Your Thesis performance (March 6), and the Three-Minute Thesis competition (March 7). But again, be sure to view the full Ideafest schedule. Like many outstanding students, the term “overachiever” is a good fit for graduating international Visual Arts major Guochen Wang. An award-winning photographer before leaving China, Chen continued to find success during his undergrad years: not only did he mount two solo exhibits at local galleries, but he also picked up awards at both the Sidney Fine Art Show and the Victoria Arts Council’s LOOK show. “I like taking pictures of people on the street and telling a story through the lens,” he says. Yet his future interdisciplinary path started to come into focus when he took his first video art course and then enrolled in the Writing department’s popular film production elective, where he worked on the short film Fear or Favour. Fusing his artistic passion with tangible career goals, over the past four years Chen has founded the UVic Film Club, joined the CineVic Society of Independent Filmmakers, started his own commercial production company, joined CHEK TV’s production team (where he helped create over 20 commercials), served as the director of photography and camera operator for local company Botega Creative Ltd, worked as a sessional instructor for the Beifang International Education Group and volunteered on a number of independent films shot locally — all while finishing his undergraduate degree. Clearly no slacker, Chen applied for and was accepted as a screenwriting major in the Writing department’s MFA program for the 2018 fall session. 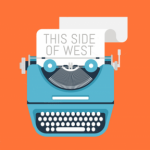 No question, UVic’s Department of Writing has produced scores on notable alumni — see the current success of writers like the 2018 Man Booker finalist & Giller Prize shortlisted Esi Edugyan for one — but this week, current students will be in the spotlight when the Writing student anthology This Side of West hosts their annual Editors’ Reading. Starting at 6:30pm on Saturday, Oct 20, TSOW will be kicking off a new year at a special event at Hillside Coffee & Tea (details below). Come hear this year’s staff read their work from across all genres, and get a taste for what they’ll be interested in when it comes to new work. 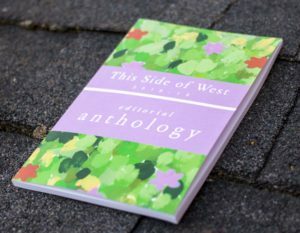 Running since 2003, TSOW publishes an annual collection each spring featuring the best student work coming out of the Writing department. It’s this sense of independence that helps Writing students cut their teeth with the editorial process. “Student publications are important because they give students an opportunity to go through both sides of the publications process on a lower-stakes stage than when publications credits and national distribution are involved,” says Smith, now on his second term as TSOW editor-in-chief. Indeed, given the steady stream talent coming out of the Writing dept, it’s no surprise that past TSOW issues have featured future published authors and editors, including the likes of poet Garth Martens (2011 Governor General’s Award finalist, winner of the Bronwen Wallace Memorial Award), novelist Marjorie Celona (2012 Giller Prize nominee, winner of the prestigious Waterstones 11 literary prize, shortlisted for the Amazon.ca First Novel Award) and poet Emily McGiffin (finalist for the CBC Literary Awards in 2004 and 2005, winner of the 2008 Bronwen Wallace Award for Emerging Writers from the Writers’ Trust of Canada). This year’s group of student editors — including Karine Hack & Jennifer Landrey (creative nonfiction), Marley Sterner & Emma de Blois (drama), Kim Dias & Hana Mason (fiction), and Kai Conradi & Naomi Duska (poetry) — is clearly keen to keep that winning streak going, and they’re hoping this reading will generate interest among current Writing students. Submissions guidelines and the online submission form are available on their website. At Saturday’s Editors’ Reading, expect to hear work by the current editorial team ranging from fiction and creative nonfiction to drama and poetry. A published anthology of the editors’ work will also be available for purchase at the event. 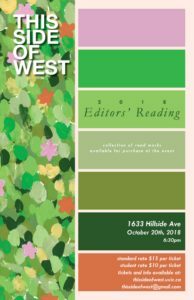 This Side of West Editors’ Reading, 6:30pm Saturday, Oct 20, at Hillside Coffee & Tea, 1633 Hillside (across from Hillside Centre). Admission is $10.